If you're in Ohio when you read this on Sunday, it will probably be 60 degrees outside. I took this photo on Tuesday, when it was well below freezing. The chickens didn't want to go out into the pasture, but when I opened the front door to the hen house, they all scampered outside. The white Leghorns were the first ones outside, and they are not even considered a winter-hardy breed. There is a myth that chickens can't handle cold; in reality, they are much more bothered by heat. Although it sounds nice, heating a hen house isn't kind to the birds. Imagine if you were outside working in your winter coat, and came back inside your heated house--and then were unable to take your winter coat off. You'd be overheated, right? Chickens' bodies prepare for winter as the temperatures dip, and they can't take that winter coat off when they go inside. 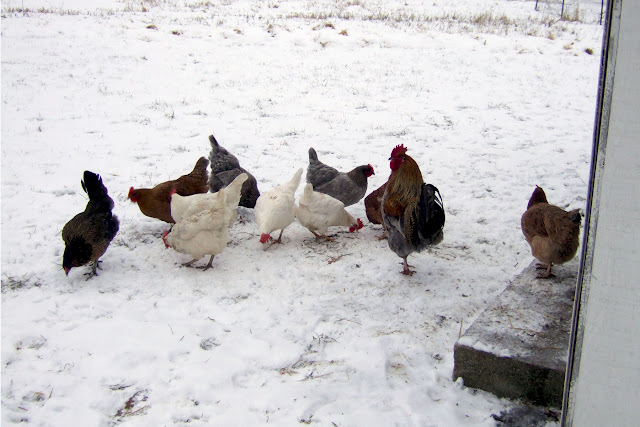 The best thing to do for chickens in the winter is to make sure they have a place that is well ventilated but draft free, lots of food, and unfrozen water. Then they'll be fine well below zero degrees Fahrenheit. We don't put a heat lamp in the hen house until temps approach -20! Let's hope that the thermometer doesn't dip that far in the coming week, but I would like the snow to come back. Here's hoping for a perfect white Christmas for you and yours. Merry Christmas!